Welcome to Rada Cutlery where you will find the best kitchen knives you can buy at the best price. We offer a wide selection of kitchen cutlery that will help you perform any kitchen task. 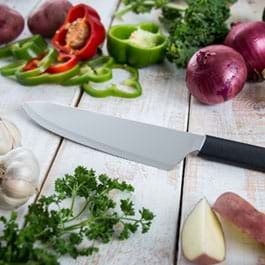 Our product line of kitchen knives includes over 25 options. Each kitchen knife comes with a lifetime guarantee. When we say our products come with a lifetime guarantee we mean that Rada cutlery will replace any of our products you return to us because of defects in materials or workmanship. Please consider that like all fine cutlery our silver brushed aluminum handle cutlery should be washed by hand then dried. The cutlery with the black stainless steel resin handle can go in the dishwasher or it may be hand washed as well. The way you treat your cutlery will affect the overall performance. At Rada Cutlery we offer an array of paring knives for all your slicing and dicing needs. 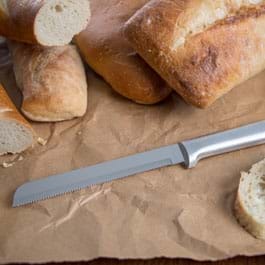 The best selling paring knife we sell is the Regular Paring Knife. 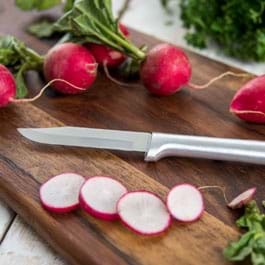 This knife has a 3 ¼ inch blade that works well for slicing a variety of fruits and vegetables. 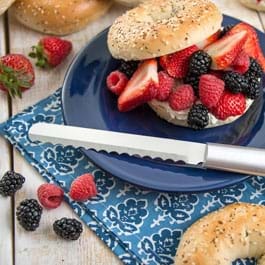 Another popular paring kitchen knife loved by our customers is Granny Paring Knife. This is the smallest paring knife with a 2 3/8 inch blade. The curved blade makes peeling fruits like pears and apples a simple task. 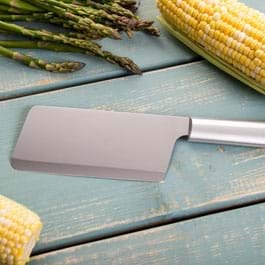 Our Made in the USA kitchen knives are manufactured in our one location in the heart of the United States, Waverly, Iowa. We take pride in offering a line of cutlery’s every cook loves—from professionals to beginners. The Serrated Steak knife always receives raving reviews from our customers. Why? They love the 3 3/8 inch serrated blade. 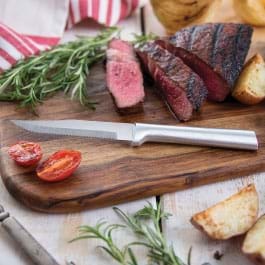 The knife allows the perfect leverage for slicing all types of meat like beef, pork and chicken. 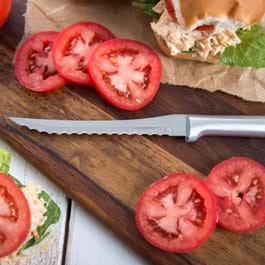 Many people also use this knife to cut other foods like vegetables as well. This knife, like all of our products, come in the two handle options: black and silver. This is the perfect made in the USA kitchen knife.